As the mobiles are changing their shape now a days, we were uncertain regarding the charging of devices. We have roller phone mobile concepts, paper thin mobile concepts and so on. But how these mobiles can be charged is the big question. I mean, mobiles generally use Lithium Ion batteries for their smooth running. And the current scalability of these batteries are about an inch or two. 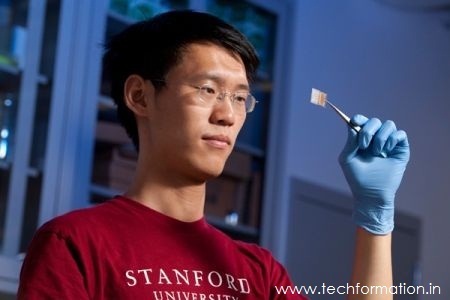 Thanks to one of the Stanford graduate, Yuan yang who developed Transparent Li-ion battery with his professor Yi Cui which paves the way to the future consumer electronics. This battery is paper thin [50 Microns] and transparent too.These batteries are made up of Copper, Aluminum and a special substance called Polydimethylsiloxane (PDMS). 'PDMS is dead cheap and is already being used in contact lenses and in plastic surgeries' says Yang.